We had some late ducklings and though they had about the best mother duck I have ever known, they were getting picked off by hungry predators. We have the remaining two in the mudroom in a cage, keeping them until they were larger, stronger, and faster. The time has come to force them out. Fall is breaking into winter here and the animals saw it coming while we were still enjoying unusually warm and sunny October weather. While some of this big beautiful country is still warm and even has the air conditioning running, this morning I was outside in front of my house screaming at my van while I pulled on frozen doors and desperately looked for my ice scraper. These lovely little ducks need to develop their deep winter feathers and the mudroom just isn't cool enough. So, right now as I type this, my teenaged boys are finishing fixing up the winter home for the ducks. These ones will be in a dog kennel with a warming light as close to them as is safe. 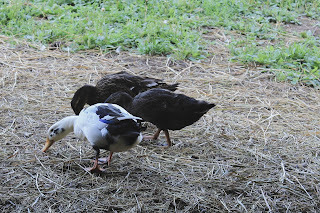 The other ducks will be in with them but they will need a few days to get used to each other so that they don't fight. We don't want to lose anymore. Over the next month, we will move the light up and put the ducklings with the others. Eventually, they will have a shared light and some small nesting boxes with hay to cuddle in. I love watching ducks curl up against each other, wrapping their long necks around each other's. It reminds me of watching my children sleep with all their legs and arms tangled together. As much as it bothers me to think about moving the ducklings (who really aren't babies anymore) out to a place twenty to thirty degrees cooler than where they are now (the mudroom is heated to the upper fifties to prevent my washer from freezing), I have to do it. They need to be a little cold so that they grow the feathers that they need. I am soft but I have to harden myself so that I can harden this little things. When my children express concern about it, I have to tell them firmly that we need to do this, that we will make it as easy as possible, but in the end they will have to be a little uncomfortable. We love these ducks and we do it because we love them. We harden off plants, we harden off ducklings, we wean lambs onto fresh grass after hay, and we harden ourselves a little while we do it. Critical life lessons for the children and in more ways that we know.When we carefully weaned the lambs onto grass after they were weaned from the mother and given hay, it was hard for the children. We had to chase the lambs into the barn and away from the sun and wind and bright green pasture not because we didn't care but precisely because we did. Lambs will give themselves bloat if they have too much grass. Perhaps explaining this to my children will make them think twice when I limit sweets. It is an important life lesson for them, in ways that they cannot immediately appreciate. 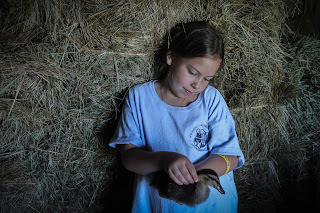 In the beginning, the ducklings were in my kitchen next to the wood stove with a low light. I would watch them and sing to them and talk to them while I cooked. Eventually, they were in the mudroom with no light. The first night they were out there with no light, my three year cried for them. But now she sees the stiff feathers coming in all over their bodies and she sees that I was right. I wanted them to get feathers, real ones, not the lovely fluff of a new duckling. They look more and more like proper ducks with large wings and spiky new feathers. Now comes the next step of moving them out to other ducks. Truly, it is as hard for me as the children. Inside I dread it though I say nothing about it. It is an important life lesson, in more ways than I can appreciate immediately. Maybe when I think about what God has ordered in my life, perhaps I will think about it and realized that He is hardening off my soul like a seedling. Perhaps He is doing it as gently as possibly but perhaps I am being prepared for what comes next. We put our littlest chicks-hatched on 9/11-out at night a while back. My seven year old, who takes care of them, kept asking if she could bring them back in just one more night. I hardened my heart and they are doing great. Great feathering, and growing healthy and vigorous. Ducks are much cuter and more lovable than chicks, too. I'd have a harder time being tough on them. We're planning to get some ducklings in Spring. Oh wow you have soo many amazing things packed in your blogs. The first attraction to your blog was the pictures of red maple leaves. They are soo beautiful. It caught my sight.